Lee Dickson is never a man lacking in enthusiasm, but he puts even more feeling into his words when asked how he has found his first season as Saints skipper. “I’ve loved it,” says Dickson, before adding, “I’ve really enjoyed it!” for extra effect. “The fact you’ve got so many good people around you makes it so much easier. “Woody (Tom Wood), Dylan (Hartley), Fodes (Ben Foden), Calum (Clark) - people like that make your job easier. It seems likely that Saints will continue to stick with the current man as captain, but Dickson knows they could just as easily look to the likes of Wood or Clark to take up the role. Those men may be seen as more likely to start every week, with Jim Mallinder having employed a rotation policy at scrum-half during the past three seasons. That policy came into effect because Kahn Fotuali’i, who joined in the summer of 2013, and Dickson were seen as equals, but it remains to be seen whether new signing Nic Groom will be given as similar role to the departing Samoan. Even if Groom is not, Dickson knows there is no way he will be able to rest on his laurels, with Tom Kessell also pushing for a starting spot having shown good signs of progression at Saints during the past season. “He’s been phenomenal,” Dickson said of former Cornish Pirates and Bristol player who joined last summer. “Next season, for the first time in a long time, three of us will be fighting it out. “If you don’t play well, you could be down to third in the pecking order, so I’ve got to make sure I’m doing everything in my power in the off-season and in those pre-season games. “I’ve got to make sure I’m on the ball at the start of the season. But with next season some months away and the one just gone still fresh in the mind, the focus switches back to the 2015/16 campaign. It saw Saints finish outside the top four for the first time since 2009, which was first year of six that Dylan Hartley skippered the club. It is to Hartley’s credit that Northampton never missed out on the Premiership play-offs during his time as captain, but it would certainly be unfair to blame Dickson for the fact that they have not made it this time round. “Everyone can see it’s been frustrating for players, fans staff and it’s been a bit of a topsy-turvy year,” Dickson said. “We didn’t start the best but in the middle period we played some of our best rugby - it was the Saints way, we were on fire and we won six out of eight games. 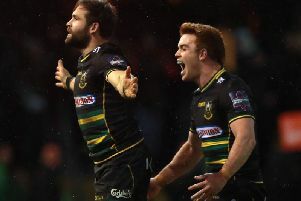 And one period was more frustrating than any other for Dickson, who ended the season at Saints’ top try scorer thanks to a burst of six tries in as many games during February and March. The 31-year-old was knocked unconscious during the April 3 defeat at Wasps and was forced to miss the following weekend’s Champions Cup quarter-final at Saracens and the Premiership loss to Leicester the week after, when Saints’ hopes of making the top four were all but extinguished. “It was a frustrating four or five weeks,” Dickson said. “I felt I’d just got myself back to where I wanted to be and then I got knocked out. “You have to take four weeks off, doing nothing, and it was just brilliant to be back on the pitch during the last couple of games. “You put so much effort into the season and when it comes to quarter-finals and playing against Leicester at home and you can’t play, it’s the most frustrating period of time.